Comfortable, safe and great value entry level buoyancy aid. Aimed at paddlers new to the sport, looking for a budget buoyancy aid that still meets minimum safety requirements. Comfortable and functional and conforms to all CE safety regulations. Featuring 5 points of adjustment you can achieve a safe, secure fit. Also has a small zipped front pocket for essentials. Aimed at touring and recreational paddlers alike. This buoyancy aid is simple to wear, constructed from hard wearing materials and has enormous storage space in the front pockets. New from Peak UK and incorporates both side and zipped entry BA's to create a comfortable 'wrap' entry system. Also has room to carry a hydration bladder. 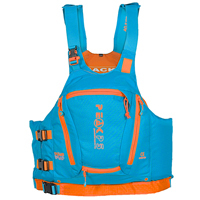 Palm's high end sea kayaking buoyancy aid, with all the features that serious paddlers are looking for in a PFD. Including a rear bladder pocket and fleece lined hand warmers! Designed primarily for long distance racing, this PFD is also perfect for non competitive paddling. Ultra lightweight, non-restrictive and also has plenty of pockets for drinks, snacks etc. Modern buoyancy aid designed for touring and sea kayaking. Main features include a high back design for added breathability and comfort when used with tall back rests. Lightweight, slimline buoyancy aid - very comfortable to wear for all types of paddling including touring and recreational canoeing. Tall back, perfect for use with Sit On Top seats. Low cut, and designed to keep the wearer cool and comfortable whilst paddling hard, or in warmer conditions. The Ion has a double zipped front pocket and 'cool flow' ventilated back. 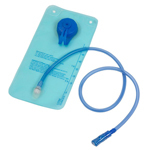 1.5L hydration bladder constructed from medical grade TPU, and can be used with buoyancy aids that have a dedicated bladder pocket, such as the Palm Kaikoura.